The Hills Shire is in the north-west region of Sydney. 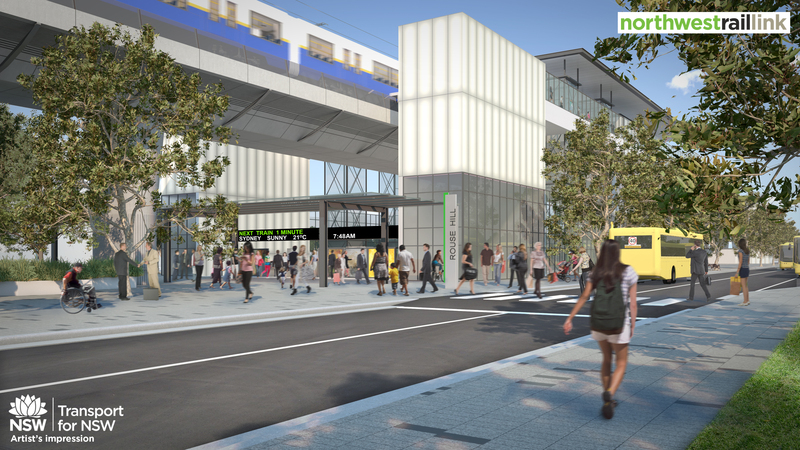 Big news in The Hills at the moment is the North West Rail Link, which will connect Rouse Hill to Epping, and involve the construction of eight new railway stations. To assist with the necessary disruptions, The Hills Shire council has put out a pamphlet: Is your business north-west rail ready? The pamphlet suggests you may want to stagger your work times, or work from home until the North West Rail Link is complete. The North West Rail Link is the “baby” of the Hills Shire council, and as often happens, their baby name was “stolen” when Kanye West and Kim Kardashian called their daughter North West. However, in this case New South Wales has precedence, because they came up with the name North West in 1998. Why it takes 15 years between the proposal and sending out pamphlets is a question only local government can explain. (If you’re really curious, Wiki it). There is no date set for ending the project, which may not occur until 2020. Hope you’re north-west rail ready! North is one of the four major compass points, and in Western culture, it is considered the primary direction, and the one from which all other directions are taken. By convention, north is placed at the top of globes and maps, although the word comes from an ancient Germanic root which means “down, under”. This may come from an ancient root meaning “left, below”, because north is to the left when you face the rising sun. For people in the northern hemisphere, north is the direction towards the Arctic, and when they think of “northern lands”, they probably envisage ice and snow, or at least cooler temperatures. In many fantasy tales, dangerous or evil creatures come out of the north, such as Hans Anderson’s Snow Queen, and the dragon in Tolkien’s The Hobbit. However, the ancient Greeks believed that in the far north lay the country of the happy Hypoboreans, who lived in a land of eternal sunshine (kind of on the right track due to the Midnight Sun). In the southern hemisphere, north is the direction of the Equator, and we may think of northern places as hot and dry, or steamy and tropical. In Australia, the northern part of the country Australia has a certain mystique as vast, hot, empty of people, and rich in natural resources. North is also an English surname. The aristocratic North family hold the title of Earls of Guildford, and Frederick North, the second Earl, was Prime Minister of Great Britain during the American War of Independence. Frederic Dudley North, descended from the British Prime Minister, emigrated to Western Australia in the 19th century and undertook several important posts, including representing the state during Queen Victoria’s Jubilee. The origin of the surname is unclear – it could refer to someone who lived to the north of a particular town, or possibly someone with Norse ancestry, or who looked as if they might have. West is another major compass point, conventionally placed on the left side of maps, and lying in the direction of the setting sun. It seems to be from an ancient root which means “downward”, referring to sundown, and is closely related to the word evening. Because the west points toward the sunset, in many cultures it represents death (to go west, means “to die”). The ancient Celts imagined the Otherworld could be found far out in the western sea, while the ancient Greeks believed the paradisaical Fortunate Isles were located in the western ocean. The island of Atlantis was also thought of as being to the west, far out in the Atlantic. In Britain, the West End is the posh part of London, while Westminster is the seat of power, and the West Country the land of legends and fairy tales. Westward Ho!, by Charles Kingsley, is set in the West Country and deals with adventures in the West Indies. Its title is the same as a Jacobean satire by Dekker and Webster on west London, taken from the call of Thames watermen. The playwrights later wrote Northward Ho!, set in north London. In the United States, the western frontier lands in the 19th century symbolised freedom, adventure, opportunity and progress, as in the famous phrase, Go west young man. The Old West is not so much a time and a place as part of the American psyche, and the American West helped inspire imaginative works as diverse as Little House on the Prairie, Star Wars, The Great Gatsby, On The Road, Breaking Bad, and The Wizard of Oz (which has a Wicked Witch of the West). The iconic Wild West played a major role in the development of the Australian myth of The Bush, and there is much we can identify with, as we have our own frontier country, the Outback. Here the west is Western Australia, the largest state, and the most geologically ancient part of the country, at over 4 billion years old. The oldest life forms on Earth, the stromatolites, can be found in Shark Bay, and the world’s oldest fossil, 3.4 billion year old bacteria, was discovered in Port Hedland. The West also refers to Western civilisation, an idea which goes back to the ancient Greeks. Today it has political connotations, with people believing that “the West” stands for any number of values they might like or dislike. It is political rather than geographic, because “western” countries are all over the world. The English surname West denotes someone who lived to the west of a town, or someone who had moved to the area from the west. It turns up early on in Essex, the most easterly part of England. This is another aristocratic surname, for the Wests were an old family originally from Devon, in the West Country. North and West have both been used as personal names since at least the 16th century, with West much more common overall. Most Norths and Wests have been male, although the first North I can find in the records was a girl, and there are many female examples of both names. A larger proportion of Wests have been female, compared to Norths. There are thousands of Norths and Wests of both sexes in Australian records, although most of these are middle names. North and West are names which sound a little out of the ordinary, and yet are straightforward and instantly recognisable. Everyone can spell and pronounce them, and they’re easy to explain: “North, like the North Pole”, “West, like the Wild West”. They seem modern, but have surprisingly long histories, and layers of meanings, of which you are free to choose the ones which appeal to you the most. Kanye and Kim reportedly chose North because they saw it as meaning “the furthest up”, and therefore the pinnacle of their relationship, which strikes me as very northern-centric, and making a second child’s name problematic. If the first child’s name marks the pinnacle of your relationship, what’s left for Number 2? POLL RESULTS: North received an approval rating of 40%, and West a rating of 35%. Most people preferred the names North and West on a boy rather than a girl. 98% of people thought the name North West was more suitable for a railway than a human. I grew up in Alaska and have known boys and girls named North, so the name just feels unisex to me. While I think North West is a better name for a railway, I’m not-so-secretly in love with it as a name for a baby, and I think it makes a lot of sense for that family(very memorable name). I was really surprised to see how few female Norths there were compared to female Wests – to me, North seems much more unisex than West, but it doesn’t seem to be the case. I like North West very much on a person, and I am very interested to see what they choose for North’s brother or sister! By calling her what they understand as meaning Best Ever Possible, you do wonder where they will go for the next one.